The discussion centers on the idea that Wiccans and those neo-pagans who practice traditions that have been influenced by or are superficially similar to Wicca (“Neo-Wicca”) have privileges that the rest of the neo-pagan community doesn’t experience. What’s more, the discussion at Pantheacon touched upon a suggestion that this privilege is a symptom of an oppressive power structure within broader Paganism. Let me first say that yes, there is a “slant” or bias in neo-paganism that does favor Wiccan or neo-Wiccan groups and it is an issue worth discussing, addressing, and redressing. As someone who practiced Kemetic Reconstruction, tradition that wasn’t influenced in the slightest way by Wicca, for more than a decade, I am very much aware of this slant. I know, firsthand, how frustrating it is that the overwhelming majority of publications, websites, and events are intended for Wiccan and neo-Wiccan audiences and participants. I, personally, know how irritating it is when someone assumes: your theology is a polar duotheism (e.g, “What God and Goddess do you work with?”), sacred space is defined as a circle, sexuality is a part of one’s religious ritual experience, or you follow the Rede and Threefold Law. I understand intimately from personal experience how this is inconvenient, unfair, and alienating. But let’s be honest: quite frankly, the assertion that this is privilege is ridiculous. Yes, as I outlined above, there is a bias in the broader Pagan community towards Wiccan and neo-Wiccan groups but this does not equate to privilege, a very real issue faced by many, Pagan and otherwise. In fact, to discuss the issue of Wiccan/neo-Wiccan bias in modern Paganism with the very same language used to describe the social and political inequities and struggles faced by, for example, minorities of race and sexual orientation creates (intentionally or not) an inadequate comparison. And, what’s more, as both a sexual and racial minority–a person for whom issues of oppression and privilege are a daily reality that impacts my life, I think it borders on offensive. Privilege is a part of a system of oppression in which the minorities are forced to participate to their own disadvantage. There can be no privilege without a system of oppression and there is no evidence that a system exists where Wiccan and neo-Wiccan groups are oppressing non-Wiccan groups. (Yes, indeed, there are a number of anecdotal examples many of us can recount where Wiccan or neo-Wiccan persons or groups have perpetrated discriminatory behavior but privilege necessitates a systemic problem.) For example, “white privilege” necessitates the system of racial oppression that has marred our history and continues to do so today just as “heteronormative privilege” requires a system of oppression based on sexual orientation. If Wiccans and neo-Wiccans are not oppressing non-Wiccan individuals and groups, then “privilege” is not the appropriate word to use. Instead, a more appropriate word might be “bias”. The fact that there are more Wiccan or neo-Wiccan events (or publications, websites, groups, etc.) is not an example of Wiccan privilege anymore than the fact that there are more fraternities serving African-Americans than any other minority in the US is an example of African-American privilege. The fact that Pagans of any stripe need to organize their own events in order to be among like-minded peers is an example of (Christian) privilege, though. Likewise, the fact that the a ritual put on by Wiccans or neo-Wiccans is focused on their theology or praxis is not an example of privilege–it’s their event; you aren’t suffering their privilege if you are a willful and voluntary attendee of a ritual they chose to put on. Appropriating the same language used to describe the hardships and injustices of minorities in larger American society not only fails to accurately describe the issue and adds complex baggage but also detracts from and hurts the already complicated issues of privilege and oppression they face. * As an aside, I also think it’s pretty ironic that a movement that purports to want to spread awareness about marginalization can’t be bothered to use the word the other group uses as a self-identification but instead uses a word so insipid it reads as pejorative. But of course, nobody wants to say “Wiccan bias.” That might be something they have to do something about, as opposed to this imaginary “Wiccanate privilege” that they can always pin on someone else. This. This a hundred thousand times! You said it better than we did, but we got to swear more. We’ll call it a tie. So right. I thought the people who were talking about privilege were actually looking at systematic oppression when I first read references to this conversation. I was appalled to find out that a matter of an erratic, usually ignorant, bias by some individuals or groups toward certain practices was described in the same words as the institutionalized horrors of racism and gender based harassment. These people need to get out there and experience some real oppression. Talk about a glaring symptom of privilege: not even being aware that one has no clue about the true impact of systemic cruelty. Thank you for telling these folks to get a life. Thanks, Robin! Appalled is a great word for my initial reaction as well. Excellent post, thank you so much for sharing your perspective. It is a post I will be referring others to during these rather frequent recent discussions of privilege, bias, and perception. I so appreciate your ability to elucidate the inappropriate use of the word “privilege” in this debate. Truly, the word ought to be “bias”. Wiccans and Neo-Wiccans being more numerous doesn’t make them more powerful. Indeed! And more importantly, it doesn’t make them oppressive. Excellent Post. I’ve been struggling with this debate(?) in relation to P-Con and a few conversations I had there are shortly afterwards. The words “privilege”, “bias” and “opinion” might all have some commonalities but they are not synonymous. Most of the online discussions I’ve seen tend to dismiss one person’s tradition-based practices or opinions as signs of their privilege. And events like Pantheacon do offer spaces for folks that aren’t Wiccan or neo-Wiccan. Are there assumptions made about circle casting and calling Elements and the like, for sure. Should/could folks be more aware of those practices that seem universally Pagan but actually aren’t? Of course.Would it be an interesting and worthwhile exercise to have the opening ceremonies or panel discussions lead by folks of different traditions? Sure, why not. However, if I were presenting a ritual or discussion and the description of the event said I was a practicing Pagan of XYZ stripe, then the format of my presentation would be mine to create and yours to choose to be part of or not. That’s not me exercising an oppressive belief system over your belief system and undermining your right to exist and have rights in society. it’s me talking about stuff that interests me. If I went to an Asatru, Gardnerian or Druid event, I’d expect to see differences in content and application. In fact, that’s probably why I’d go to those events to learn more about practices that aren’t my own. Having the choice to sample different traditions at an event like P-con is why many people attend in the first place. And lastly, the panel discussion that started this blogobrouhaha was fantastic and well done. It focused on real areas of privilege and I heartily recommend folks listen to it. I believe T.Thorn Coyle has released it as part of the “elemental Castings” podcast series. Well said. Thanks for your insight! Why is it , that every time I hear/read about Pantheacon , it is in reference to some kind of power struggle , or controversy over perceived power and or privilege ? Methinks I shall not ever go . It seems to be the antithesis of my egalitarian pagan practice , and sounds more like “organized religion” with hierarchies , pigeonholing , and pecking orders . Please don’t let things like this stop you from attending PantheaCon. It is a wonderful event. I missed it this last time because I’m currently outside the USA, but friends who attended tell me this was a tiny, near-insignificant event at PCon, despite all the blogginess about it. As one of the largest Pagan events in the USA, PCon draws thousands including many Pagan bloggers engaged in this debate, but I reckon most Pagans are just going about their business and care very little about it. Yes. What Cosette said. P-Con was simply amazing this year. Great rituals, lots of juicy discussions in workshops and in every corner of the hotel. The panel discussion was highly attended. Most of the secondary discussion about “WP” (I shan’t use the term du jour) happened in a smallish gathering in a hospitality suite with several big name pagans in attendance and some folks clearly came with an agenda. Again, thank you for sharing your thoughts and perspectives on the subject, I enjoyed reading your article. These were two different events that happened at Pantheacon. The Wiccanate privilege talk in the COG suite was not the same as the Pagans and Privilege Panel. The discussion where Wiccanate privilege was discussed happened on Sunday in the hospitality suite and was not a part of the main programming. Thank you for putting your finger so exactly on the reason my eyes begin instinctively to roll the minute I heard the term “wiccanate privilege”. I had hoped at the time it was being done to be provocative, and that was my assumption. That in itself is a problem. To twit for the sake of twitting is pretty much the definition of immaturity. I personally have had more than enough of that in the pagan community over the last 30 years. I’d like to see us all move on and put our energy somewhere more appropriate than slapping each other with cream pies – or worse. I have also experienced the discriminatory behavior coming from several different “Wiccan” groups I was once part of. – Such a shame that a group of folks who claimed to be so “spiritual” and divinely-inspired consistently resorted to such unenlightened behavior when feeling “challenged” by differing beliefs. Two of those organizations did not last too much longer after I left. Hmmm! I wonder why??? We have had a problem with “Pagan” groups not lasting much more than a few years in my area. It is interesting that ONE has actually lasted almost eight years though. Quite frankly, I despise the word and the context of “privilege”. To me, Rights are a greater gift of Life than mere privileges! “Privilege” is what turns a society against itself and changes it for the worse. “Privilege” knows of NO RESPECT for the differences of others. BTW: This “white privilege” is so bogus and political in nature. I have YET to see any real “privilege” from being one sort or another. “White Privilege” is purely a political canard being used as a weapon against whites, one and all, for perceived continuing ills allegedly caused by today’s whites, all supposedly due to the white ancestors’ actions (in which a very distinct minority are actually responsible). Why aren’t Planned Parenthood folks being labeled as racist and biggoted for the fact that abortion kills more than nineteen times as many colored (unborn) babies than actual murders? – Oops! I forgot, Planned Parenthood is in a privileged position that the political system adores. 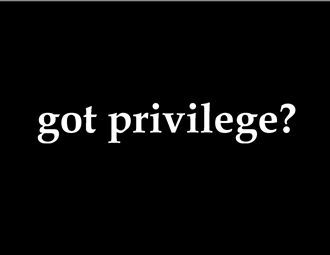 “White Privilege” does NOT exist beyond any bounds further than those privileges we create and earn for ourselves. There is no “race-based” automatic privilege for whites. You will never win this argument with me, because it is an argument devoid of actual fact. You want more privilege? Then go out and “make it happen” with good, honest, hard work like everyone else is expected to! What about those of us (who happen to be born white) who have virtually slaved OUR lives away trying to earn our place in “The American Dream”, and had all of these crying opportunists lobby government to take it all away from us, all under the guise of “reparations”??? – I’m sorry, but what some of my forefathers MAY have done, I should not be held accountable for! And neither anyone else who is here today. All it is – is just another poor excuse to forcibly take from another (producer) to give to those who have earned it not. Keep your “White Privilege” argument away from me, because I am just not buying it. Some important points have been made here about the use of the word “privilege” and the word “bias”. That said, I think it’s important to look at what may be underlying the Wiccanite Privilege concept and not get lost in discussion of choice-of-words. What in our Pagan culture is happening that is causing the call to examine that the WP event was intended to address? It is interesting to me that it was hosted by COG, a Wiccan-base group. Thanks for this article. It really sums it up nicely! You make some valid points here- the word “privilege” is getting thrown around in ways which are potentially social irresponsible and misleading. Bias is probably a better term to be using. Even better, IMO is to focus on a positive concept- inclusiveness in pagan communities. I just went to Paganicon (in the Twin Cities) There were people of many different traditions there, not just Wiccan. (And the Wiccans I met were all quite friendly!) There were people with disabilities, various gender identities and sexual orientation. But there were only a handful of people of color- and no discussion of racial issues. That definitely puts things into perspective- as do things like the “you can discriminate if you religion says so” law in Arizona. This is an excellent summary of the point being missed, thank you. It gives me much food for thought that I hadn’t considered before. I’m not one who is much up in arms about Wiccanate privilege. I think the phenomenon observed is real and does extend beyond just the effect of Wicca and Wicca-derived (or spackled) traditions being the majority of the modern Pagan movement, but for the most part it’s just annoying, not actively oppressive. The problem isn’t just that they’re the majority, the problem is when they assume (to the point of asserting it and rejecting alternatives) that Wicca-derived theology and ritual structures are pan-Pagan, and move to enforce that assumption on non-Wiccanate Pagans. However, I’m not sure even the really problematic elements qualify as forcing non-Wiccanate Pagans to participate in their own oppression relative to Wiccanate Pagans. This does happen, and has the effect of excluding non-Wiccanate Pagans from the Pagan community in the area covered by such events. But is that a systemic-scale problem in the Pagan community? What definitely IS systemic in scale, but isn’t really at the hands of Pagans against other Pagans is the effect of awareness of Wicca but not other Pagan traditions in Jail/Prison and Military chaplaincy. People in these government-restricted contexts require active acknowledgement in order to practice their religious freedom. They are only usually permitted to practice Wiccan-structured Pagan traditions, but they are rarely supported in any need to practice a non-Wiccanate Pagan tradition, and are all too often actively oppressed for either. Obviously a lot of progress has been made, and more liberal areas and individuals in positions of power can make some experiences more pleasant than others, but that doesn’t erase the larger problem. But these are more products of Christian privilege than acts of Wiccans or Wiccanate Pagans against non-Wiccanate Pagans, and thus it’s not clear that privilege is the right word for the advantage Wiccans and Wiccanate Pagans have over non-Wiccanate Pagans in these contexts. The problem will definitely NOT be improved by Pagan communities dividing into smaller political groups to promote only their smaller branches of Paganism. *Headtilt* Isn’t that exactly the argument against “Cis-“?